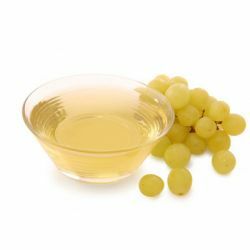 The oil is cold-pressed from the seeds of grapes that have been grown without chemicals. Biochemical research has shown that grape seed oil contains oligomeric proanthocyanidins (otherwise known as OPCs). It has a high affinity with the structure of our skin cells, absorbs easily without a greasy feeling and helps carry other ingredients deeper into the skin. It leaves skin feeling comfortable and soft. The oil contains high amounts of linoleic acid (omega 6 essential fatty acid). These are all extremely desirable properties for a cosmetic ingredient. It supports the skin cell membrane, helping to maintain the normal structure of both nerve and epithelium cells. Similarly, it is noted to be very good for repair of skin tissue around the eyes. We use organic grape seed oil in our Vanishing Cream facial moisturiser a wonderfully light skin cream. The organic grape seed oil assists in the absorption of the other beneficial ingredients, meaning your skin feels the benefits straight away.